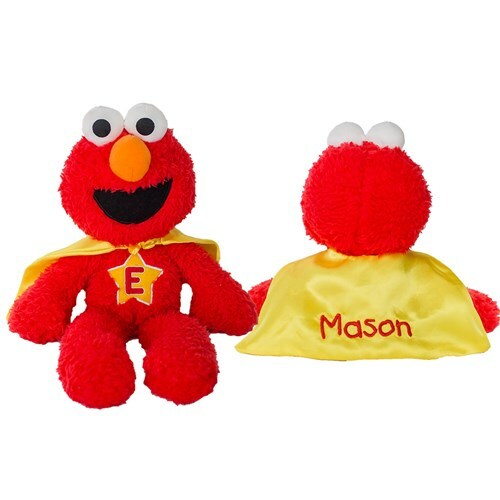 Our Embroidered Elmo Superhero will bring comfort and joy to all your little superhero. Whether shopping for a birthday, new baby, get well, your recipient will love a personalized gift like this! Our Personalized Sesame Street stuffed animals like this Elmo will be embroidered with any name in red thread on the back of the cape. This plush superhero Take Along version of the popular Sesame Street character features a costume cape with matching star insignia on the chest. Long limbs are perfect for on-the-go adventures. Additional Details Because this design is design by you, it creates a wonderful gift for all occasion. Be sure to view our entire collection of Embroidered Plush Animals.